Should illegal immigrants get access to government services? Well, Toronto could become Canada's first city where that's the case. 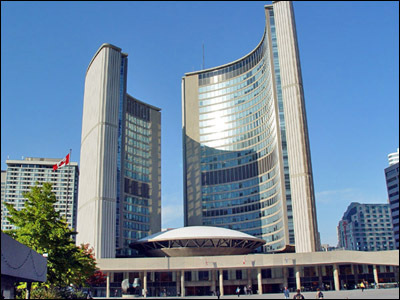 On Thursday, City Council will vote on Motion CD 18.5 — the so-called 'access without fear' motion — which could put Toronto on the path of giving undocumented migrants the ability to utilize City services such as foodbanks and homeless shelters. The rationale, of course, is that some undocumented immigrants are causing themselves and their families harm because they don't access services out of fear of detention or deportation? d. a complaints protocol and a public education strategy to inform Torontonians of our policy. The motion would also incline Council to lobby their provincial and federal counterparts for more friendly policies in the same regard. Depending on whose statistics you choose to believe, there are between 100,000 and 250,000 undocumented immigrants living in the Greater Toronto Area. The City suggests that this number includes those who have overstayed their visas and failed refugee claimants who, for whatever reason, haven't left the country. Immigration lawyer Michael Niren says that while the motion is a positive step, he worries that its powers may be limited by the policies of the 'tough on crime' Harper government. "The idea that Toronto may become a "sanctuary city" is appealing to immigrant groups but in reality the Federal Government's mandate has been and will continue to be enforcement against illegal immigration. This means that Canada's largest city, if they proceed in this manner, [it] will run squarely against the tide," he told Yahoo! Canada News. "Most illegal immigrants are "discovered" by whistle blowers who usually know the person rather than government officials so I am not sure how effective creating sanctuaries will be. "But giving illegal immigrants access to services, many of whom contribute to our city in different ways, is a positive development in a very harsh immigrant climate." 30 cities in the United States have already enacted such 'sanctuary' policies; Toronto would be Canada's first. Whether the motion passes in Toronto, however, remains to be seen. In a last minute call-out for support, an organization by the name of 'No one is illegal' released a statement, Wednesday, claiming that they still don't have the 23 Councillors needed to pass the motion.